Deck the halls with LEDs and energy-efficient décor! The holidays are one of the most wonderful times of the year, but before you deck your halls to be merry and bright, the Missouri Division of Energy would like to share some energy efficiency tip to save this holiday. Switch to light-emitting diode (LED) lights. According to Energy Saver, LEDs are cooler than incandescent lights (reducing the risk of fire or burnt fingers), last longer than other options (incandescent and halogen lights), and are easier to install end-to-end without overloading wall sockets. 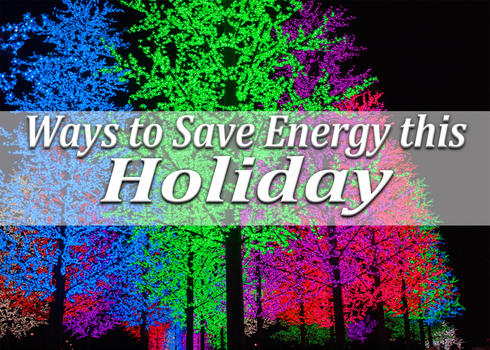 Unplug holiday light displays during the day. It is more energy-efficient to turn lights off than to leave lights on. Set holiday light displays on an automatic timer.Santa is not the only one who is busy during the holiday season. With all the hustle and bustle of the holidays, turning off your light display is probably not the number one priority; using an automatic timer can relieve the hassle. Reduce the size of your outdoor lighting display.Along with using LEDs, reducing the size of your lighting display can save money. If you are interested in a big display, then consider purchasing a light projector. Projectors come in an array of different colors and with unique shapes to project onto your house. Plan shopping trips to reduce gasoline use.Shopping for last-minute items can have you running around nonstop, which can put a strain on your gas tank (and reduce how much you can spend on gifts). Prepare a shopping list to ensure you purchase all of your last-minute items. Also, if you have more than one person in your home that needs to go to the same place, consider carpooling. Cook as efficiently as possible.Santa is expecting a baked good of some sort; bake all of your holiday treats in the oven at the same time. Moreover, when preparing your holiday meal, if possible, use a slow cooker. Opt for a fiber optic tree.Fiber optics are amazingly simple, yet beautiful and energy-efficient. Fiber optic trees use a single bulb and light is transmitted from the single bulb through hundreds of small fibers to each branch. Some fiber optic trees are even equipped with a rotating color wheel that changes the color emitted from the fibers. Fiber optic trees are now available with LEDs. Creative and reflective decorating. Decorate your home using mirrors and other reflective items. Mirrors and reflective decorations enhances your environment bringing more light and depth into the room. For more energy efficiency tips visit energy.mo.gov.